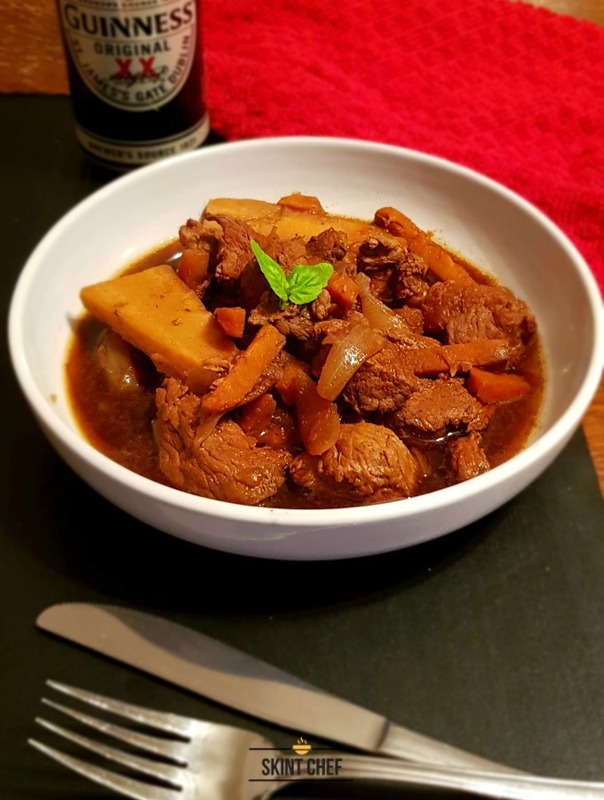 Comfort food doesn’t get much better than this slow cooked Beef and Guinness Stew. With just a little prep, this beef stew will melt in your mouth. 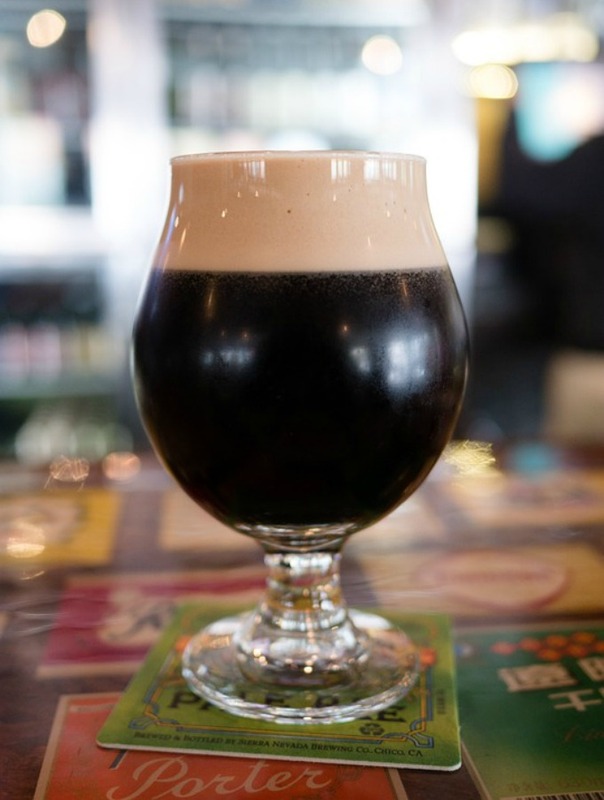 While it may not be your choice of tipple, there are 10 million glasses of Guinness drunk around the world every day, and more than 1.8 billion pints are being sold each year! Instead of drinking the stuff, you should try it in your cooking. 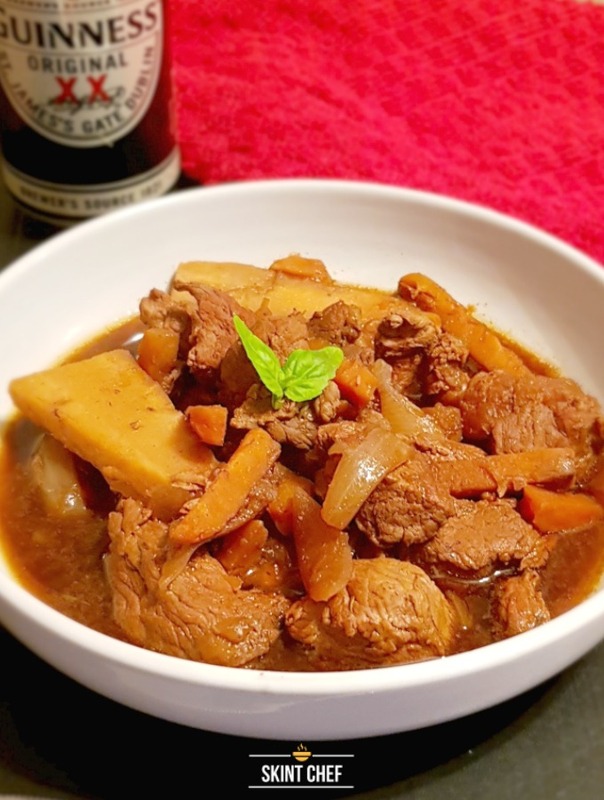 With the deep and rich flavour, Guinness brings a delicious, warming flavour to a beef stew that you will regret not trying earlier! You need to spend a little bit of time up front on this recipe (I’m talking 10-15 minutes, not hours). Once the prep is done, it’s a matter of dumping everything into your slow cooker. You’re then able to spend the day doing whatever you want until your beef stew is ready to be served. I love using a slow cooker for many, many reasons. Yes, the food comes out delicious and tender because you’ve been able to cook it for such a long time, but it’s also good on your pocket. There are many benefits to using a slow cooker, and the cost-saving benefits are my favourite. Slow cookers use less electric than a traditional oven/hob so won’t cost as much to keep on. Also, because you cook foods for such a long period, you’re able to use far cheaper cuts of meat, and they will be super tender too. The trick to getting it right is browning the meat before adding it to the slow cooker – and this is worth your time. This way you get a delicious flavour from the browned meat in your stew. The best bet it to brown your beef in smaller batches. Not crowding your pan allows all the meat to cook evenly. Don’t waste the juices once you’ve finished browning the beef as you can use it for the onions. The pan will be slightly caramelised, and you can transfer all this tasty goodness onto the onions. This will make sure you can get as much flavour into your stew as possible. However, that said, you don’t have to brown your meat before it’s added to the slow cooker, but it is worth the effort. Is it safe to leave a slow cooker on all day? Your slow cooker runs on very low wattage and is okay to be left on all day. We regularly turn our slow cooker on in the morning before leaving for school and work, and it’ll be safe 8-10 hours later when we get back in. 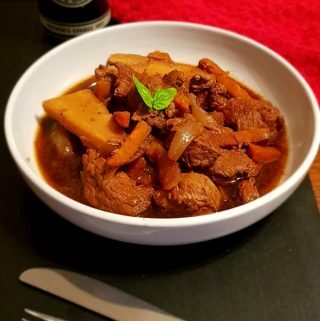 If you don’t have a slow cooker yet, so want to cook your Beef and Guinness Stew on your hob, you can, however, you won’t get such rich and deep flavours. Instead, brown the meat in a large pot, cook the onions and add all the ingredients. Then bring your stew to the boil, and lower it down to a simmer. Cover the pot with a lid and cook for 1-2 hours until the beef is tender. I would recommend looking to invest in a slow cooker – it will change your life! 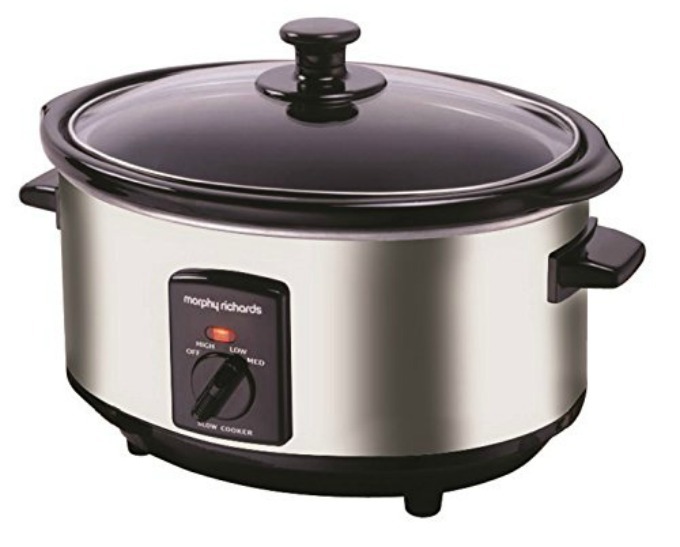 We use this Morphy Richards slow cooker, which you can get on Amazon. It has three temperature settings, as well as a toughened glass lid and cool touch handles. You can even put the pot in the dishwasher if you hate washing up. Having a slow cooker is well worth it and can open you up to so many new recipes, as well as saving you time. Do you have to use Guinness? 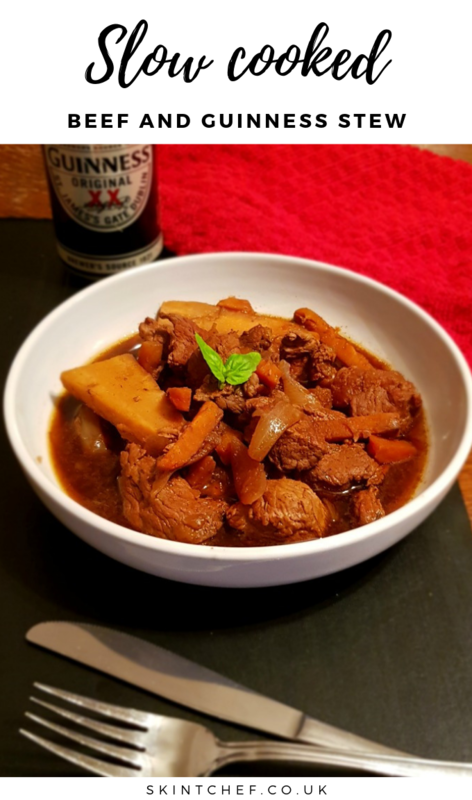 Well, you don’t have to use Guinness in your stew if you don’t want to, but the flavours of anything else will be very different. This post is no way sponsored by them, but it’s easy stout to come by in the supermarket and has a distinct flavour. 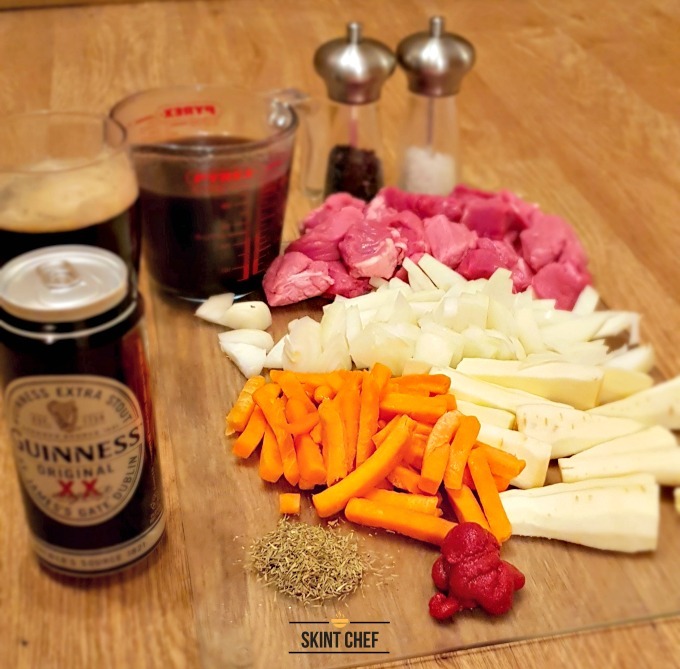 Without the Guinness, you will lose the rich intensity in the stew, but it will still taste ok.
A natural substitute (although there is no clear substitute for Guinness because of its unique taste) could be any other dark stout. If you don’t drink alcohol, you could leave it out altogether, but I’ve heard strong coffee could be added instead to keep the depth of flavour. We’ve not tried this though. Do you think it could work? Comfort food doesn’t get much better than this slow cooked Beef and Guinness Stew. With just a little prep, the meal will melt in your mouth. Using the same pan, cook the onions until browned and put in the slow cooker. Add all the other ingredients to the slow cooker and season to taste. Stir through and cook for 8-10 hours on a low heat (or 5-6 hours on a high heat) until the beef is tender. Serve with creamy mash potato and vegetables, while curled up under a big fluffy blanket.